I hate to keep sounding like a broken record on this topic, but I must ask. Is Michele Bachmann the NEXT Sarah Palin? Several patriots have said, "I adore Sarah Palin. But, she has been so destroyed in the media, she would be a disaster as our republican presidential candidate." Well to all of you who subscribe to this opinion, have you seen the shock and awe campaign launched by the liberal media to destroy Bachmann, since officially throwing her hat into the presidential ring a few days ago? If Bachmann becomes our nominee, suddenly the liberal media will portray Sarah Palin as the far more reasonable candidate rather than the ultra-conservative idiot nut case, Michele Bachmann. Should we kick Bachmann to the curb adding her with Palin on the list of unelectable candidates on our side; considered too toxic, too tea party and too conservative to win? If Cain wins the republican nomination, come election day, the liberal media will have branded Cain as the dumbest black man on the planet. Libs will laugh while parroting the same mantra. "Can you imagine the nerve of those republicans running a stupid self hating Uncle Tom n***** against a brilliant man like President Obama?" It is not over the top to suggest libs will call Cain the "n" word. As a black conservative, they call me it frequently. Since Cain's black skin will not exempt him from "liberal media destruction," perhaps we should add Herman Cain to the unelectable list. OK, who's next? Huntsman? Romney? Here is what the left will say about these guys BEFORE either wins the republican nomination, "They are more palatable than those tea party extremists." Folks, my point is whoever wins the republican presidential nomination will be relentlessly and viciously targeted for destruction by the liberal media/Democratic party. Obama is the left's Great Liberal Hope. Thus, they will attempt to politically terminate ANY contender. The mindset that the tea party must select a liberal-lite milquetoast moderate to appease the liberal media and independents is absurd. Back in the early 80's, I was clueless about politics. A reporter looked at me as if I had two heads when I told her I loved Reagan. I later learned that I was suppose to hate Reagan because I was black. Liberals told the black community republicans were the KKK without the sheets. I told the puzzled reporter referring to Reagan, "Every time I hear this man speak, I feel good about myself and my country." Patriots, let's go for the gold and select an unapologetic conservative who will speak to ALL Americans without pandering to any group. I believe there are enough decent Americans of all races who will see through the left's slander campaign; hear and respond to truth, justice and the American way. 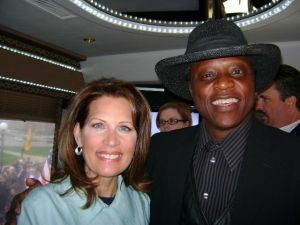 Quoting Michele Bachmann, "Obama WILL be a one term president".